For starters…we only see part of the dress. I can’t ask the model to turn around or show the hem. Plus Titian’s painting style is…imprecise…when depicting trim. But I got lucky: I found a pattern likely inspired by this painting. 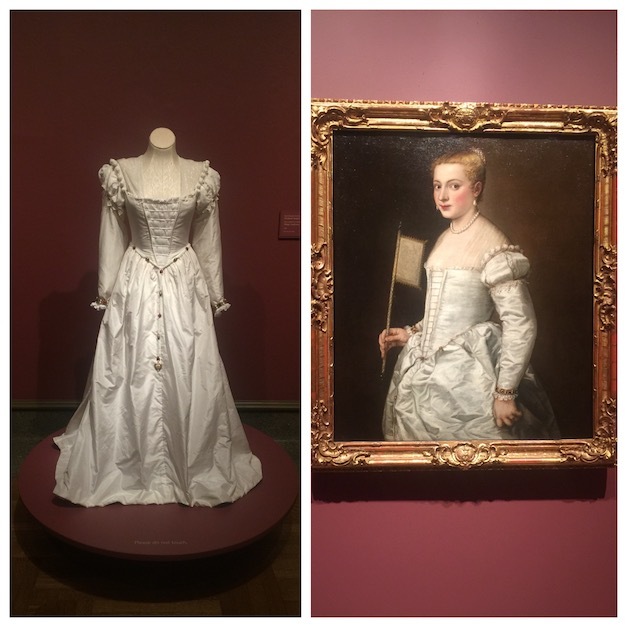 Since few Renaissance dresses are extant (they were worn, after all), costumers rely heavily on period paintings such as Titian’s Portrait of the Lady in White, for understanding style and construction. Elizabeth Hopkin works on the sleeves of the Titian dress. Also, bless you, Renaissance reenactors. They love to blog: not only could I find instructions, I could learn all the modern adaptations. The dress (sottana) material looked to me like silk taffeta (crunchy). The underdress (camicia) was probably a light-weight linen, scholars say. Armed with materials and pages and pages of pattern instructions, I leapt in. • Clothing was made from 28” wide fabric rectangles sewn together: that was the widest the looms produced. I didn’t have that problem with modern fabric so I didn’t have to use as many rectangles. Score! But now I feel sorry for all those Renaissance hand-sewers without electric lights. • Padding was added to the bodice so they’d look plumper, ON PURPOSE. • Fullness came from waist and hem padding plus a petticoat “hooped” with rope. • I’m really bad at counting pearls. • Lacing up a bodice is time consuming. Every time I had to dress and undress her to test this or that, I ground my teeth with impatience. I’m very impressed that people did this daily. Plus, pulling all your camicia puffs out just right…! • The squeezing involved in creating the columnar look of the torso is impossible to duplicate with a dress form. Sigh. • Taffeta is much more resistant to wet, muddy dog spray than I feared. I’d love to try it again. As part of the anniversary celebrations, Columbus Museum of Art partnered with the Gemäldegalerie Alte Meister in Columbus’ sister city, Dresden, Germany, to bring Titian’s masterpiece Portrait of a Lady in White to Ohio. Titian’s Lady in White is on view in Columbus from August 31, 2018 – December 9, 2018. Learn more about Titian and the re-creation of the dress during the Curator’s View Wednesdays@2 talk on September 12. 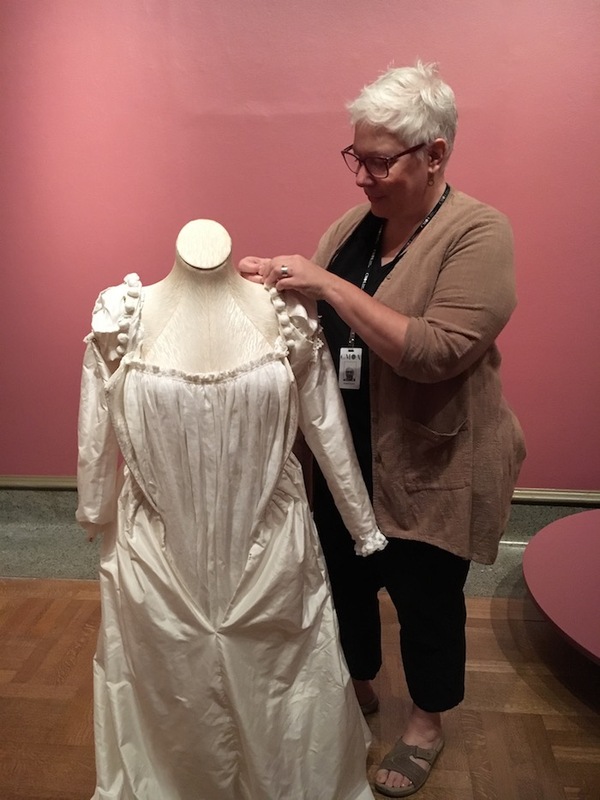 Elizabeth Hopkin is Associate Registrar for Columbus Museum of Art, and has been designing and building costumes for ballet and theatre in Central Ohio for more than 14 years. She has worked on projects with Opera Columbus, Ballet Met, and is resident costume designer for Columbus Dance Theatre where she designed the costumes for the ballet Claudel, which won the Greater Columbus Arts Council award for Artistic Excellence.